Figure 9.5.1 The magic of the campus? As more and more teaching is moved online, even for campus-based students, it will become increasingly important to think about the function of face-to-face teaching and the use of space on campus. Sanjay Sarma, Director of MIT’s Office of Digital Learning, made an attempt at MIT’s LINC 2013 conference to identify the difference between campus-based and online learning, and in particular MOOCs. He made the distinction between MOOCs as open courses available to anyone, reflecting the highest level of knowledge in particular subject areas, and the ‘magic’ of the on-campus experience, which he claimed is distinctly different from the online experience. the informal learning that takes place between students in close proximity to one another. the importance of the social networks developed by students at MIT that provide opportunities later in life. Easy and frequent access to laboratories is a serious contender for the uniqueness of campus-based learning, as this is difficult to provide online, although there is an increasing number of developments in remote labs and the use of simulations. Opportunities for dating and finding future spouses is another contender. Probably the most important though is access to social contacts that can further your career. I leave it to you to judge whether these are unique features of face-to-face teaching, or whether the key advantages of a campus experience are more specific to expensive and highly selective elite institutions. For most teachers and instructors, though, more concrete and more general pedagogical advantages for face-to-face teaching need to be identified. In the meantime, we should start from the assumption that academically, most courses can be taught equally well online or face-to-face, what I call the law of equal substitution. This means that other factors, such as cost, convenience for teachers, social networking, the skills and knowledge of the instructor, the type of students, or the context of the campus, will be stronger determinants of whether to teach a course online or on campus than the academic demands of the subject matter. These are all perfectly justifiable reasons for privileging the campus experience. At the same time, there are likely to be some critical areas where there is a strong academic rationale for students to learn in a face-to-face or hands-on context. In other words, we need to identify the exceptions to the law of equal substitution. These unique pedagogical characteristics of campus-based teaching need to be researched more carefully, or at least be more theory-based than at present, but currently there is no powerful or convincing method or rationale to identify what the uniqueness is of the campus experience in terms of learning outcomes. The assumption appears to be that the campus experience must be better, at least for some things, because this is the way we have always done things. We need to turn the question on its head: what are the academic or pedagogical justification for the campus, when students can learn most things online? This question becomes particularly important when we examine how an increased move to blended or hybrid learning is going to impact on learning spaces. In some ways, this may turn out to be a ticking time bomb for schools, colleges and universities. As we move from lectures to more interactive learning, we will need to think about the spaces in which learning will take place, and how pedagogy, online learning and the design of learning spaces influence one another. To make it worthwhile for students to come to campus when they can do an increasing amount of their study online, the on-campus activities must be meaningful. If for instance we want students to come to campus for inter-personal communication and intense group work, will there be sufficiently flexible and well-equipped spaces for students to do this, remembering that they will want to combine their online work with their classroom activities? In essence, new technology, hybrid learning and the desire to engage students and to develop the knowledge and skills needed in a digital age are leading some teachers and architects to rethink the classroom and the way it is used. Steelcase, a leading American manufacturer of office and educational furniture, is not only conducting impressive research into learning environments, but is way ahead of many of our post-secondary institutions in thinking through the implications of online learning for classroom design. Their educational research website, and two of their reports: Active Learning Spaces and 360°: Rethinking Higher Education Spaces are documents that all post-secondary institutions and even k-12 planners should be looking at. Formal learning spaces have remained the same for centuries: a rectangular box filled with rows of desks facing the instructor and writing board….As a result, today’s students and teachers suffer because these outmoded spaces inadequately support the integration of the three key elements of a successful learning environment: pedagogy, technology and space. Change begins with pedagogy. Teachers and teaching methods are diverse and evolving. From one class to the next, sometimes during the same class period, classrooms need change. Thus, they should fluidly adapt to different teaching and learning preferences. Instructors should be supported to develop new teaching strategies that support these new needs. Technology needs careful integration. Students today are digital natives, comfortable using technology to display, share and present information. Vertical surfaces to display content, multiple projection surfaces and whiteboards in various configurations are all important classroom considerations. Space impacts learning. More than three-quarters of classes include class discussions and nearly 60 percent of all classes include small group learning, and those percentages are continuing to grow. Interactive pedagogies require learning spaces where everyone can see the content and can see and interact with others. Every seat can and should be the best seat in the room. As more schools adopt constructivist pedagogies, the “sage on the stage” is giving way to the “guide on the side.” These spaces need to support the pedagogies and technology in the room to allow instructors who move among teams to provide real-time feedback, assessment, direction and support students in peer-to-peer learning. 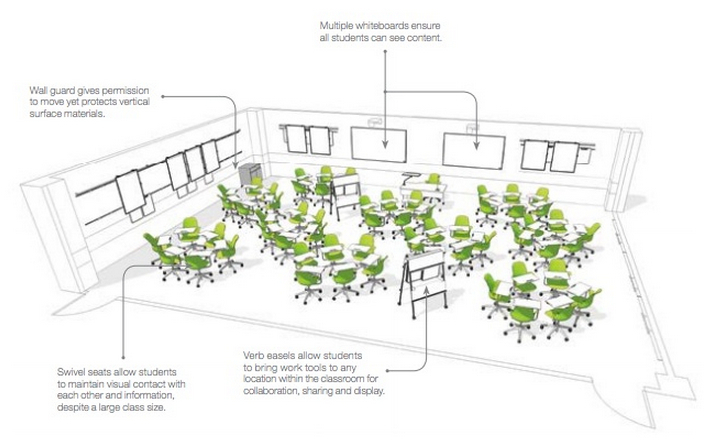 Pedagogy, technology and space, when carefully considered and integrated, define the new active learning ecosystem. With students now doing an increasing amount of their work online (and often outside the classroom), the classroom needs to take into account this fact. This means opportunities for accessing, working on, sharing and demonstrating knowledge both within and outside the classroom. Thus if the classroom is organized into ‘clusters’ of furniture and equipment to support small group work, these clusters will also require power so students can plug in their devices, wireless Internet access, and the ability to transmit work to shared screens around the room (in other words, a class Intranet). Students also need quiet places or breakout spaces where they can work individually as well as in groups. Tawnya Means and Jason Meneely, from the University of Florida at Gainsborough, reported at the UBTech 2013 conference that several departments have redesigned their class space to enable both formal and informal active group learning. Small, mobile tables with ports for a range of mobile devices, and software that enables both instructor and student control over screen sharing and projection are used to support case-based, problem-based, project-based and collaborative learning. Another redesign was to convert an old kitchen and classroom into an open cafeteria-based group learning area, with a breakout area for individual study, thus allowing students seamlessly to combine socialising, group study and independent study within the same overall space. Meneely, quoting Winston Churchill, said: ‘We shape our buildings and then our buildings shape us.‘ Meneely claims that when faculty are presented with such use of space, they naturally adopt these more active learning approaches. Nevertheless, given the current financial context, we should not assume that the classroom time for these redesigned large lectures classes will be spent in small groups in individual classrooms (there are probably not enough small classrooms to accommodate these classes which often have over a thousand students). Larger spaces that can be organized into smaller working groups, then easily reconvened into a large, single group, will be needed. What the space for these large classes certainly should not be is the raked rows of benches which now are now the norm in most large lecture theatres. Steelcase is also doing research on appropriate spaces for faculty. For instance, if a university or department is planning a learning commons or common area for students, why not locate faculty offices in the same general area instead of in a separate building? Indeed, a case could be made for integrating faculty office space with more open teaching areas. how much they need to invest in physical infrastructure when students can do much of their studies online. all major new purchases of classroom furniture to replace old or worn out equipment should first be subject to a review of classroom designs. The important point here is that investment in new or adapted physical classroom space should be driven by decisions to change pedagogy/teaching methods. This will mean bringing together academics, IT support staff, instructional designers and staff from facilities, as well as architects and furniture suppliers. Second, I strongly agree with the statement that we shape our environments, and our environments shape us. Providing teachers and instructors with a flexible, well-designed learning environment is likely to encourage major changes in their teaching; stuffing them into rectangular boxes with rows of desks will do the opposite. will we need additional classrooms and additional lecture theatre buildings if students will be spending up to half their time studying online or in flipped classes? do we have enough learning areas where large numbers of students can work in small groups and can then quickly reconvene? do we have the technical facilities that will allow students seamlessly to work and study both face-to-face and online, and to share and capture the work when working physically together on campus? would we be better investing in the re-design of existing space rather than building new learning spaces? What is clear is that institutions now need to do some hard thinking about online learning, its likely impact on campus teaching, and above all what kind of campus experience we want students to have when they can do much of their studying online. It is this thinking that should shape our investment in buildings, desks and chairs. If we accept the principle of equal substitution for many academic purposes, then this brings us back to the student on the bus question. If students can learn most things equally well (and more conveniently) online, what can we offer them on campus that will make the bus journey worthwhile? This is the real challenge that online learning presents. It is not just a question of what teaching activities need to be done in a face-to-face class or lab, but the whole cultural and social purpose of a school, college or university. Students in many of our large, urban universities have become commuters, coming in just for their lectures, maybe using the learning commons between lectures, getting a bite to eat, then heading home. As we have ‘massified’ our universities, the broader cultural aspects have been lost. Online and hybrid learning provides a chance to re-think the role and purpose of the whole campus, as well as what we should be doing in classrooms when students have online learning available any time and anywhere. Of course we could just close up shop and move everything online (and save a great deal of money), but we should at least explore what would be lost before doing that. I worked in one school where the facilities manager posted a notice in every classroom requiring the teachers to leave the classroom after a lesson with desks in neat rows facing the front. I therefore spent almost 25 per cent of lesson time with students re-arranging the desks for group work then tidying up afterwards. 1. If you were designing from scratch a learning space for a group of 40 students (maximum), what would the learning space look like, given all the potential technology and teaching methods you and the students could be using? 2.If you have a lecture class of 200 students and wanted to change your teaching method, how would you redesign the teaching and what kind of space(s) would you need? A recording of a webinar on this topic, including discussion and participants’ comments can be accessed here: https://contactnorth.webex.com/contactnorth/lsr.php? The webinar was organised by Contact North|Contact Nord, Ontario, and took place on 23 November, 2015. 9.5 The future of the campus by Anthony William (Tony) Bates is licensed under a Creative Commons Attribution-NonCommercial 4.0 International License, except where otherwise noted.